C&S ARTS AND CRAFTS CORP.
1.By heat transfer printing or dye sublimation. 2. 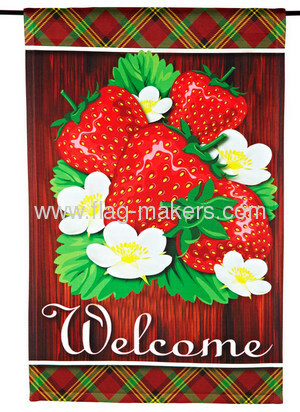 (large)Size: 25"-28"x37"-40" normal size: 27"x39"
(Small)Size: 11"-13"x16"-18" normal size: 12"x18"
5.Triat: High-colored, lifelike-visual with high quality. Customer can specify the size and material. All quotes are based on the receipt of camera-ready artwork or electronic artwork. Printing plate or film may be charged while special flag design or images with very small quantities. Artwork formats AI, EPS & CDR. GIF, JPG, TIF, BMP, DOC and PDF or your available format will be acceptable. Artwork or other materials submitted by you or your client for our use in producing an order will be accepted as being in full compliance with all laws regarding copyrights, trademarks, patents, licenses, and other similar types of protection. You and your client agree that, by submitting artwork for our use, these laws will not be violated and this company shall not be held responsible for compliance with such laws.